The response to this little doodle that I did with my nephew Mori has been amazing. Can a doodle spark a revolution? 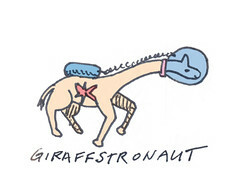 Is there a little Giraffstronaut in all of us trying to get out? Get your t-shirt at the Pivotorium (kids, men’s and women’s sizes/shapes).